In 2008, excess weight accounted for the loss of 94 million years of life in the United States. Over the past 10 years, weight-related medical bills have doubled. While losing even modest amounts of weight can be beneficial to your overall health and pocketbook, nearly 7 adults of every 10 remain overweight or obese. Today, Ideavillage Products Corporation announced that the novel emulsion, Fabuless(TM), developed in Sweden and found nationally only in its weight management supplement SlimShots(TM), is promising help in the fight against the battle of the bulge. 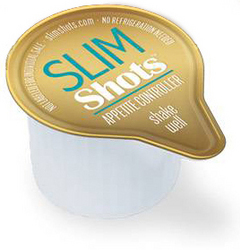 SlimShots is a liquid appetite suppressant that comes in a "pod" about the size of a dairy creamer. Available in a new Chocolate and the original Vanilla flavor. In 2008, excess weight accounted for the loss of 94 million years of life in the United States(1). Over the past 10 years, weight-related medical bills have doubled(2). While losing even modest amounts of weight can be beneficial to your overall health, and pocketbook, nearly 7 adults of every 10 remain overweight or obese(3). In a world of super-sized meals and an endless array of on-the-go fast and snack foods, the toughest hurdle in weight loss is reducing the amount of food consumed daily. Today, Ideavillage Products Corporation announced that the novel emulsion, FabulessTM, developed in Sweden and found nationally only in its weight management supplement SlimShotsTM, is promising help in the fight against the battle of the bulge. "Fabuless," said Ron Boger, executive vice president of SlimShots, "is a remarkable and breakthrough active ingredient in the weight management arena." It is a breakthrough, he noted, which required 10-years of research and development and the $12 billion life-sciences company DSM Nutritional Products, to create. "In the end, it was worth the wait," said Boger, adding, "SlimShots has the first active ingredient that is as natural and wholesome as the food on your table, works, and is clinically shown to reduce the amount of food you eat up to 30%." The quest to create a safe and effective active ingredient to combat weight gain and re-gain began with understanding the role fats play in creating a sense of fullness and satisfaction. Determined to create a diet aid that could trigger the body's natural appetite mechanism, the Ileal brake, required researchers to find the right combination of fats, in the proper amount, and which moved undigested into the Ileum, the upper portion of the lower intestine. The quest paid off in the development of the now patented and clinically proven water-based palm and oat oil emulsion, Fabuless. Recently peer reviewed and published in the Scandinavian Journal of Gastroenterology, September 2009, the emulsion's mechanism of action clinical trial effectively suggests the Ileal brake is tripped as demonstrated in the slowing of gastrointestinal transit time and affecting satiety and reduced hunger. Six additional peer-reviewed and published clinical trials and papers, four in the International Journal of Obesity and two in the European Journal of Clinical Nutrition, demonstrated SlimShots' active ingredient helps users feel fuller, longer. Said Boger, "Just 2 to 4 hours after consumption, users experienced eating 12.5% to 30% less food for up to 8 hours. Used daily, it adds up to a lot of calories being reduced." Working with the body's natural appetite control mechanism, the Ileal brake, makes SlimShots unique in the diet aid category. While there are many over-the-counter dietary supplements available, few work with the body natural process. Boger explained, "This novel emulsion does not alter the metabolism or heart rate like caffeine or other stimulant-based active ingredients, nor does it block the absorption of fats or cause embarrassing side effects. Your body functions normally, as it should - you just eat less and feel less hungry." Given recent concerns about dietary supplements, Boger is convinced that SlimShots and the science behind its active ingredient offers the overweight adult the most promising help against the battle of the bulge. For more information on SlimShots and the science behind the product, visit http://www.SlimShots.com. (3) U.S. Centers for Disease Control and Prevention, National Center on Vital Statistics. Health, United States, 2008. Atlanta, GA: U.S. Department of Health and Human Services, 2008.